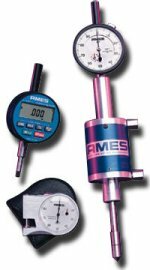 Through the genius of founder Bliss Charles Ames, the first "Dial Gage Heads" were built in 1906, thus laying the groundwork for today's highly sophisticated gaging systems. B. C. Ames offers solutions to specialized gaging needs across a wide range of industries. Please feel free to E-mail, call, or fax us with your challenges. We're ready to put over 100 years of experience to work for you.